Bit of a flat performance in the cup but we made it through and were in that hat for the fifth round and got a decent draw. Today, we were a bit below par but in a cup knock out game, you just need to get through and we did it. We got a defender back but have now lost him for three games so we are back to what we had in the last few games. We saw Diaby return and even if he did not have his best game ever, I do think he will have his part to play this season and I really hope he stays fit because later in the season, players like Wilshere may need a rest and Diaby will have to come in. Sammy Nasri started the game and the boss said the plan was to start Rosicky however, he was not fit enough so he went for Nasri. I also thought, with a knock out game, he did not want a repeat of Ipswich first leg or Leeds at home to happen again so he went for Nasri. It was a gamble, but it did not pay off. Will he make Barcelona? Probably not but we can pray and hope! 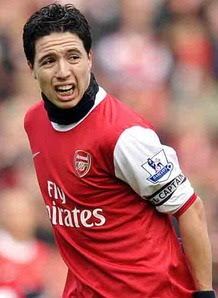 Who would anyone reading this play for Nasri in the league games and the tie with Barcelona. Arshavin returning to his left side of midfield position? Diaby playing on the left as he has in the past? Put Theo on the left and play Bendtner on the right? Or anything Ive missed out? It is a massive blow to lose Sammy Nasri at such an important time. With tough looking games at Newcastle or at home to Everton and Barcelona, he will be missed. A mention for Cesc Fabregas, how good is he? He may not be the vocal Tony Adams leader however, he certainly leads by example. He came on and ran the game and was superb. He can control the tempo of the game and can fashion chances for himself and his team mates. He really is a special talent and i hope he stays here for as long as possible because truly, he can win this club many trophies. Everton come to the Emirates on Tuesday night and that is another big night for us. Robin had a rest today along with Theo and Jack so bar Nasri, we should return to the 'league' team. Everton have been quite inconsistent this season but we know what they are all about and we got a good victory at Goodison Park and need to follow that up with the double. Roll on Tuesday night! Come on You Arsenal! I think Diaby will play a bigger part then people think, Wilshere has been fantastic and is vital to our team but it is his full season so sometimes putting diaby in may just help him. Diaby Can also play behind striker or even wide so his quite versatile which helps.